Comic-Con is only days away, and it's become expected that CW's Arrowverse grows this time every year. We've already known Batwoman would be joining Arrow, Supergirl, The Flash, and DC's Legends of Tomorrow in the annual crossover event this December, but now it looks like she'll be sticking around for a while. Deadline reports a Batwoman series is in development, from Arrowverse architect Greg Berlanti and The Vampire Diaries exec-producer Caroline Dries. The series will center on Kate Kane, first introduced in 2006 as DC Comics' first openly lesbian lead character. If the show takes off and goes into production next year, Batwoman will be the first LGBTQ superhero to have their own series. 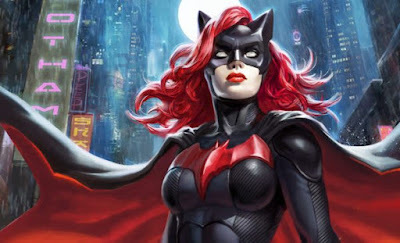 Here's the description: "In Batwoman, written by Dries based on the DC characters, armed with a passion for social justice and a flair for speaking her mind, Kate Kane soars onto the streets of Gotham as Batwoman, an out lesbian and highly trained street fighter primed to snuff out the failing city’s criminal resurgence. But don’t call her a hero yet. In a city desperate for a savior, Kate must overcome her own demons before embracing the call to be Gotham’s symbol of hope." Casting is underway for Batwoman's debut in the annual crossover, and the same actress is likely to maintain the role going forward.